Husaak Adventures welcome the IRU World Congress delegates and their partners, and are proud to offer the following trips and tours from November 3 to 11, 2018. 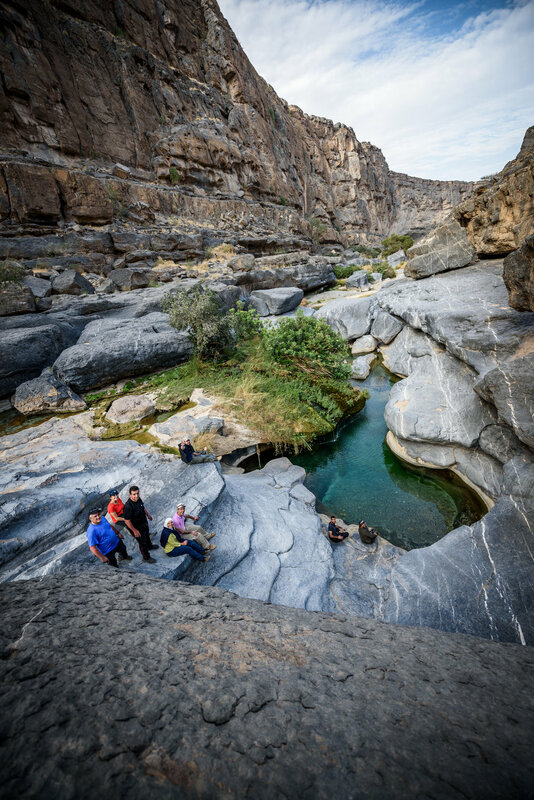 We at Husaak Adventures believe that life in Oman happens outdoors. One of our core values is to show the true and genuine side of the Omani heritage through cultural, historical and eco-tourism tours. Oman is the last frontier of Arabia, where its strongly held traditions have survived intact through the modernization of the country. Below you'll find a collection of half-day, full-day and overnight tours to suit every ability and taste. 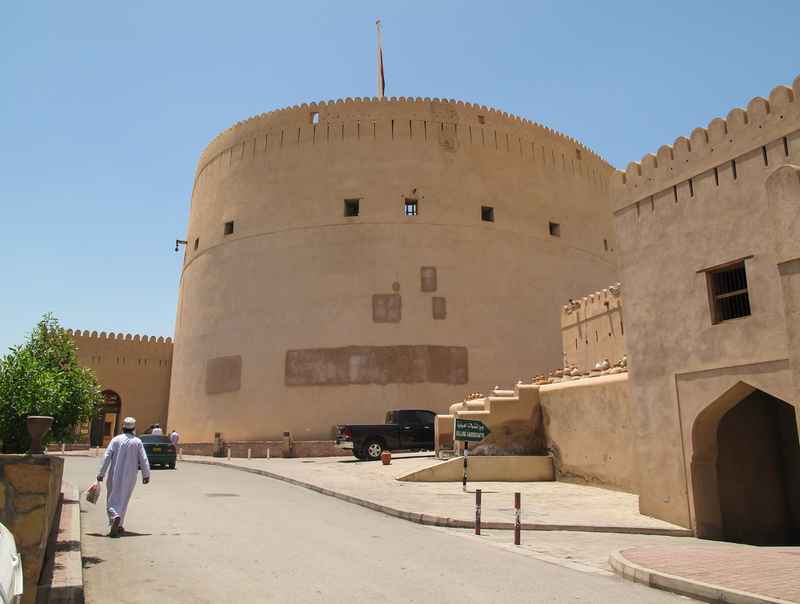 This tour is mainly about the history of Oman, forts, forts and more forts. The guests will visit 2 of the most important forts in Oman history, one of which is a UNISCO world heritage site. Both forts are located about 2 to 2.5 hours away from Muscat in Nizawa and Bahla. 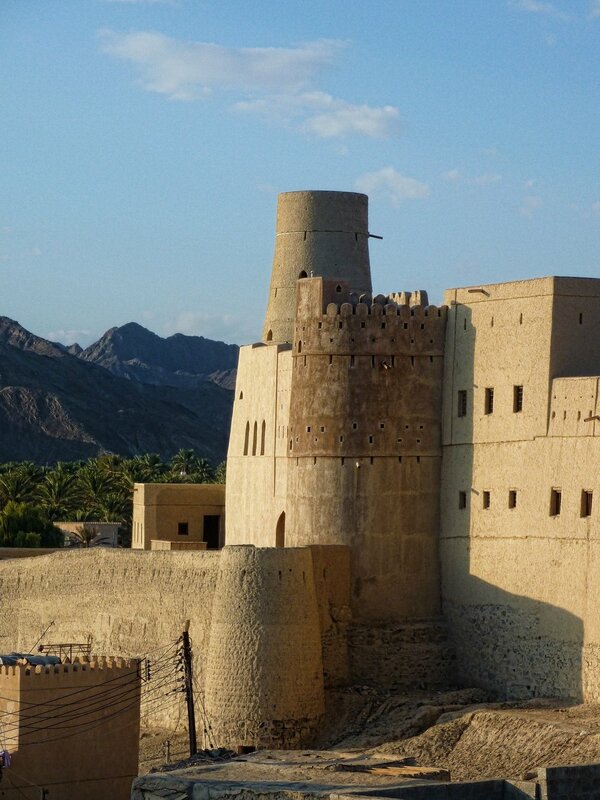 In this tour you will see Oman’s largest forts, Nizwa and Bahla and you will spend about 1 hour in each. Also a quick ancient city tour of Bahla and ending with a lunch at a local restaurant in Nizwa. It’s a fully packed day! History & Layout (From Wikipedia): “It was built in the 1650s by the second Ya’rubi ; Imam Sultan Bin Saif Al Ya'rubi, although its underlying structure goes back to the 12th century. It is Oman's most visited national monument. The fort was the administrative seat of authority for the presiding Imams and Walis in times of peace and conflict. The main bulk of the fort took about 12 years to complete and was built above an underground stream. The fort is a powerful reminder of the town's significance through turbulent periods in Oman's long history. It was a formidable stronghold against raiding forces that desired Nizwa's abundant natural wealth and its strategic location at the crossroads of vital routes. Food & Beverage: Snacks & water, lunch is included. In this tour you will spend between 45 minutes to 90 minutes at different major highlights of Muscat. The Muscat Grand Mosque with its unique structure, the Opera house and finish the tour in the National Museum. 9:45 AM – 10:30 AM Opera House tour. Food & Beverage: Snacks & water. This is one of the most unique Oman sea experience we offer. 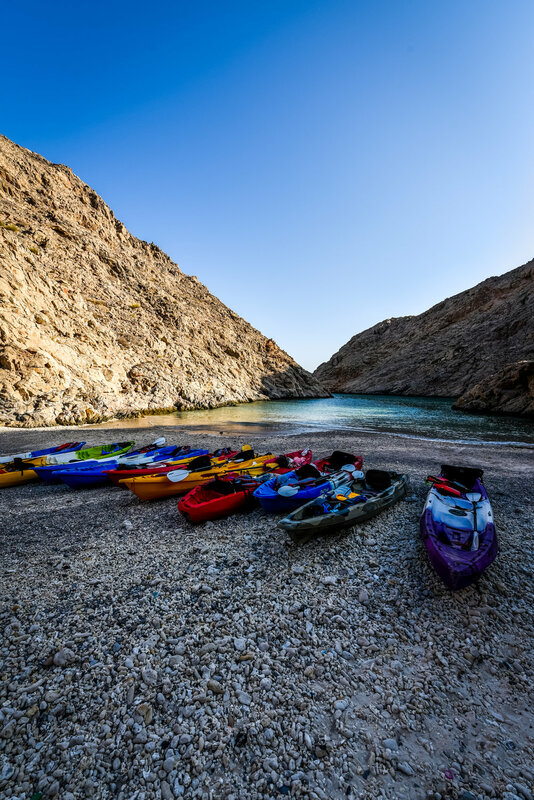 This takes you into the magical fjords of the Eastern Hajar mountains along the Gulf Oman. The variety of marine life along with the rich reefs in Bandar Khairan makes this experience world class. If you are looking to relax, chill, enjoy the cool breeze from the sea, this is your trip but remember you have to be comfortable with being on a kayak, there will be some paddling to do. The water temp is warm during the winter and the sun is hot during the day so it makes it a perfect beach weather! “Is a hiking track in the town of Muttrah, Muscat which takes you through the mountain range that encircles the natural harbor and corniche at Muttrah. The track gives you chance to see brilliant views of Muttrah, Riyam Park and the Gulf of Oman from the mountains, and will also get you to see a side of Muttrah that you probably never thought existed, like beautiful rock formations (volcanic ophilolite rocks), mountain shrubs and clear ground water which might make you think you’re in a wadi. The hike will end in Souq Mattrah, this is undeniably the most magnificent traditional market in the Sultanate. It is at least 200 years old and is made up of a complex maze of narrow walkways leading to hundreds of small shops that sell everything from Omani khanjers, halwa, and frankincense to kummahs and spices. It was historically known as the Souq of Darkness, due to its closed off ceiling and dimly lit interior, but thanks to the wonder of electricity, it is now lit and bright anytime you go visit. Unlike stereotypical markets in the Middle East and Asia, Souq Muttrah is laid back and the shopkeepers are not aggressive, they will of course overcharge tourists, but that’s how things work everywhere. It is also extremely safe and coming across a pickpocket or a con-artist is basically unheard-of”. 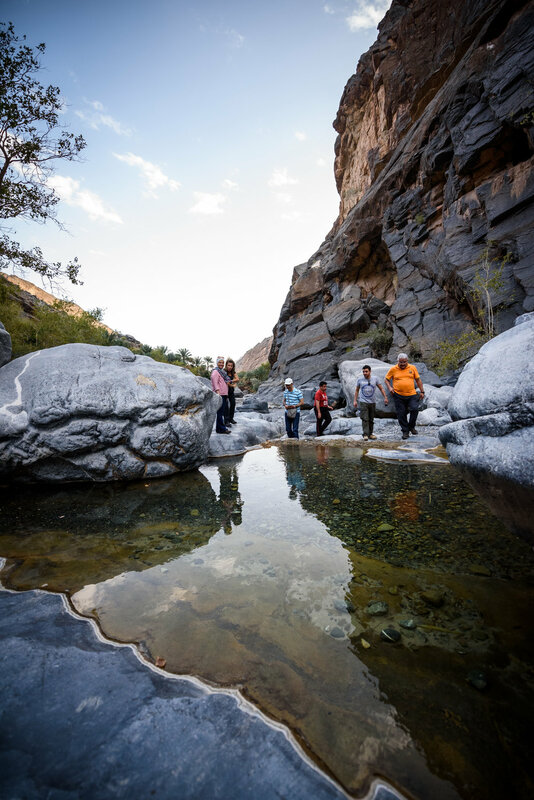 Food & Beverage: Snacks & water & lunch is provided This tour take you to the heart of the Western Hajar mountain and Jebal Shams, you will hike through the Grand Canyon of Oman and then you will see it from the top with the a bird view. Lunch will be provided at Sama Resort. 6:00 PM back to the hotel. 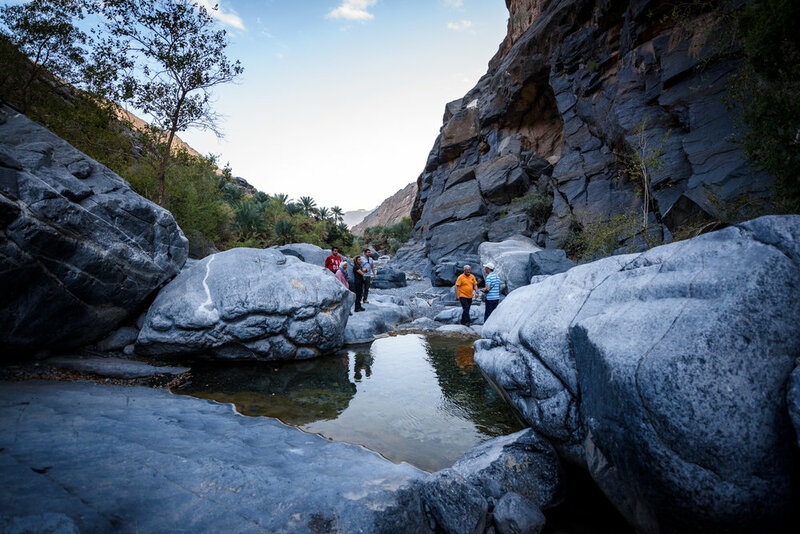 This tour take you to one of the most beautiful Wadi’s in Oman, you will start by walking up the falaj system and then into the Wadi where you will swim, go around big boulders and jump off cliffs! 5:00 PM back to the hotel. Fitness level required: Decent fitness, nice easy hike but you will swim in wadi water. Depend on fitness level 1-2 hours– Reach around sunset. 6:00 PM dinner and chill by the fire. 6:00 AM – Wake up and have breakfast. 2:00 PM Back to Muscat. Fitness level required: Easy Hike. Food & Beverage: Food provided for the duration of the trip. Dinner, breakfast and snacks.